Our first focus seems to be getting enough sleep. The three of us have a rotating three hour watch schedule - three hours on and six hours off, for each person. That means the maximum sleep time is about 5 and a half hours. If you're lucky, your 5 and a half hour period is in the middle of the night. In any case, we're always looking for horizontal time in the middle of the day, to make up for nighttime sleep deficits. As for sleep deficits, they're not always a result of the watch schedule. Sometimes the conditions are so bouncy and jerky that it seems impossible to sleep. If you get tired enough you do sleep, and then you have dreams like mine of the other night: The sailboat had become a spaceship, and the bouncy, crashy conditions were explained by the fact that we had just engaged the warp drive (a la Star Trek). On the plus side, we were going to get to Hilo sooner. The second focus is sailing conditions. The wind is always changing a little bit, so we're always going too fast or too slow, upwind or downwind of where we should be. The set of the sails has to be adjusted periodically. Maybe we need more sail, maybe less. 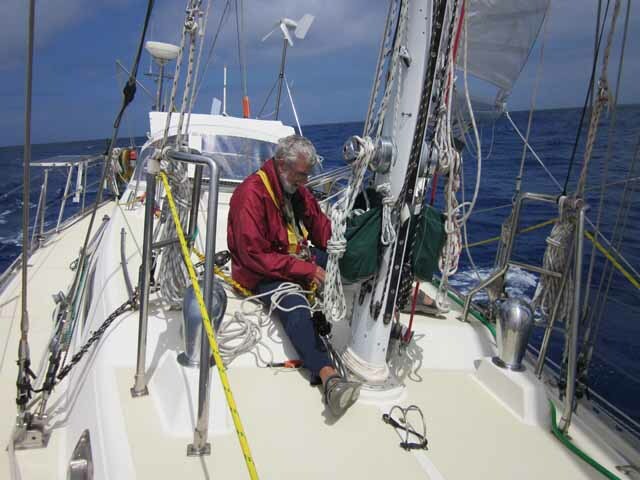 Sometimes the sail conditions become so wrong that two or three of us have to be on deck, taking in a reef, shaking out a reef, putting out the spinnaker pole, stowing it, and many more minor, but sometimes critical adjustments. Next, there's food. Major planning went into food, on my part, making sure we had as many fresh, long-lived veggies, fruits, dairy products and meats as could possibly fit in the available storage space, packed to optimize a long storage life. So that project satisfied my planning urge, but once we're on passage, we're very much working in the present. What fruit will go bad if we don't use it? What's close at hand? What's possible to assemble and cook, given the rolly, bouncy sea conditions? 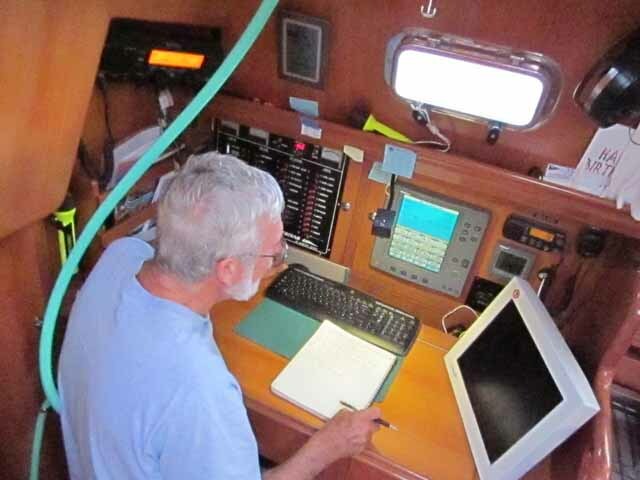 Craig has another specialized focus: he's always the engineer, keeping track of the boat systems, and inventing fixes on the fly. (I think he calls it "field expedients.") The most creative (and essential) was the fix for the refrigeration system. A small electric pump supplies cooling water to the compressor, and the pump has quit doing its job. So the compressor runs about 3 minutes, then everything shuts off. This happened only a day or two out of Cabo, jeopardizing our supply of fresh food (see above). Craig was thinking about modifying a spare pump we had acquired for the watermaker, but decided to sleep on it. In the middle of the night (see sleep, above) the inspiration came: use an existing pump - the "wash rown." 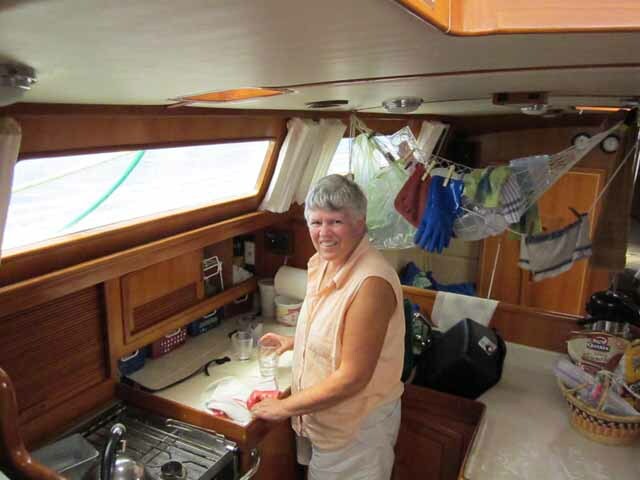 In the slide show above, I've included pictures that show the hose at its origin (at the bow of the boat), snaking along the deck, at the galley window, and finally snaking down past Craig at the nav station and into the pump inlet below the floorboards (that last part was not ever photographed, sadly). The first two photos in the slideshow were talen by Jamie Simpson. Thank you, Jamie! This is not the only thing that has malfunctioned, but Craig keeps things humming. I sometimes wonder how cruisers get along if they don't have an engineer on board. I've also observed that a high percentage of cruising couples include an engineer. What has really made the crew situation tolerable is the presence of our crew Jamie from Nova Scotia. He has uncomplainingly handled his end of the watch schedule, washing up the dishes, and providing new conversational alternatives. Craig asked him today how the reality of the passage was in comparison to his expectations, and he replied that the waves were bigger and it was colder. Indeed, we have been down to shorts only in the middle of the day, wearing fleece and long pants at night. I remember from our previous long passage (from San Francisco to the Marquesas in 2003) that the last few days are the hardest, in terms of staying in the present, and not becoming impatient for the sight of land. 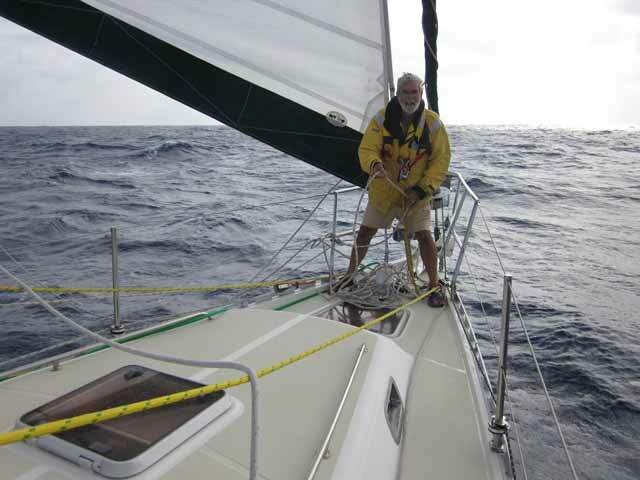 We expect to reach Hilo in 4 days unless conditions change dramatically. We're edging back into planning mode, looking at the cruising guides, books about Hawaii reef fish, the recreational atlas? This will be helpful when we get there, but may be counterproductive to peace of mind in the meantime.